Ryan Thummel, Ph.D., assistant professor of anatomy and cell biology and ophthalmology in WSU's School of Medicine. 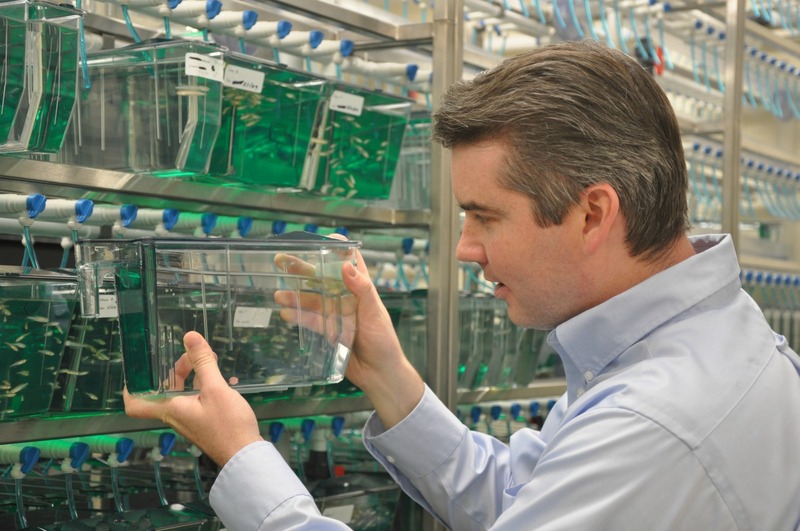 Wayne State University will host a ribbon cutting ceremony and tour of the new zebrafish aquatic housing system in the Integrative Biosciences Center (IBio) which was funded by Kids Without Cancer through the Children’s Hospital of Michigan Foundation. Earlier this year a significant gift from the organization Kids Without Cancer brought together Detroit’s major players in childhood cancer research in an innovative initiative using zebrafish to identify the genetic and environmental factors that in combination may lead to the development of childhood leukemia. Acute leukemias are the most common form of childhood cancer in industrialized countries. Kids Without Cancer, founded by a group of parents whose children received cancer treatment at Children’s Hospital of Michigan, has committed $356,000 to Wayne State University School of Medicine researchers through the Children’s Hospital of Michigan Foundation for the “Kids Without Cancer Zebrafish Initiative.” The financial support was utilized to create a new zebrafish aquatic housing system in WSU’s Integrative Biosciences Center (IBio) and to support 10 years of pediatric cancer research. Founded as Leukemia, Research, Life (LRL) in 1981 and renamed Kids Without Cancer in 2011, this remarkable organization raises money to support pediatric cancer research conducted at Children’s Hospital of Michigan in partnership with Wayne State University and the Karmanos Cancer Institute. The organization was founded by a small group of concerned parents with one thing in common: they had children in cancer treatment at Children’s Hospital of Michigan. Kids Without Cancer is proud to be the largest contributor of funds to pediatric cancer research at Children’s Hospital of all charities solely dedicated to funding cancer research. Our vision is a world in which no child has to suffer with or die from cancer - A world of Kids Without Cancer. To learn more, please visit www.kidswithoutcancer.org. To advance children’s health and wellness the Children’s Hospital of Michigan Foundation is dedicated to the support and safekeeping of children’s health and wellness through fundraising, grant making and advocacy. To learn more, please visit www.CHMFoundation.org. Wayne State University is a premier urban research institution offering nearly 350 academic programs through 13 schools and colleges to more than 27,000 students.